A disturbing call from her great aunts Astrid and Jeannette sends seventeen-year-old Francie far from her new home in New York into a tangle of mysteries. Ditching an audition in a Manhattan theater, Francie travels to a remote lake in the northwoods where her aunts’ neighbors are “dropping like flies” from strange accidents. But are they accidents? On the shores of Enchantment Lake in the woods of northern Minnesota, something ominous is afoot, and as Francie begins to investigate, the mysteries multiply: a poisoned hot dish, a puzzling confession, eerie noises in the bog, and a legendary treasure that is said to be under enchantment—or is that under Enchantment, as in under the lake? At the center of everything is a suddenly booming business in cabin sales and a road not everyone wants built. To a somewhat reluctant northwoods Nancy Drew, the intrigue proves irresistible, especially when it draws her closer to the mysteries at the heart of her own life: What happened to her father? Who and where is her mother? Who is she, and where does her heart lie—in the bustle of New York City or the deep woods of Minnesota? With its gripping story, romantic spirit, and a sly dash of modern-day trouble (evil realtors and other invasive species), Enchantment Lake will fascinate readers, providing precisely the charm that Margi Preus’s readers have come to expect. Drowning, Francie thought. That's what this was like. Such a quirky, highly entertaining, charming read set against an atmospheric small-town backdrop, full of whimsical humor, strange coincidences and mysteries. It all starts with an ominous phone call from one of Francie's eccentric aunts. "Someone is trying to kill us! ", said Astrid, but the phone connection was so bad, Francie didn't get to ask who or why, or what in the world was going on. And so Francie packed her bag and traveled back to Walpugris (population 2,02), back to the Enchantment lake where she grew up, to make sure her loveable (if just a tiny bit crazy) aunts were OK. There, she gets tangled up in an investigation involving multiple strange deaths, a hidden treasure and a soon-to-be-built road. Is there a murdered on the loose or are all these deaths just strange coincidences and freak accidents? It's up to Frenchy to uncover the truth. I enjoyed Enchantment Lake more than I expected, though I'll admit, I don't think this is a story for older YA readers. 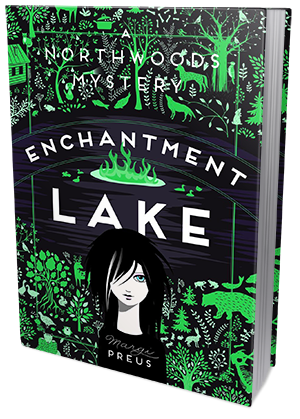 In all honesty, Enchantment Lake reads more like a middle grade novel than your typical YA, and I think marketing it as a YA murder mystery gives people certain expectations as to the content and atmosphere of this novel. I don't know if it's because of the prose style (the choice of words and phrases to describe Francie's thoughts and feelings just doesn't at all fit a teenage girl), or if it's the semi-serious, semi-detached approach, but personally, I don't find this book serious or mature enough for the regular YA crowd. I think it works way better as a middle grade novel. Sure, there is a romantic subplot in this book and people are dropping dead (seemingly from accidents, but who knows? ), but a middle grade novel can have both these elements and still be classified as a middle grade novel. Right? The writing is approachable, the descriptions of the small town setting, with the small town folks living their small town lives are pretty spot on - they brought a smile to my face, occasionally making me chuckle. I enjoyed the hilarious dialogues between Frenchy and her coockoo crazy aunties, and I liked how dynamic the plot line was. This book reads very fast, is entertaining and really quite captivating, and I had a very good time with it. Don't go into it expecting a very dark and ominous read, it really isn't that kind of book. It has its more serious moments, but they aren't many. It's just a really fun story for teenage girls who want to read something light and humorous. I have three signed copies of Enchantment Lake to give away today!